It’s sometimes comforting to know that other writers, famous ones, wildly successful ones go through the same trials the less famous and less successful do. I love “can’t look you in the voice.” And, “all I have is a pile of paper covered with wrong words.” I can relate to that. On that subject (that is, piles of papers with wrong words), I worked on Sky yesterday and today, and am slowly moving through ch 3. I have LOTS of papers with the wrong words on them. My consolation is that I also have a few papers with mostly the right words on them, and also, that all the work I’ve done on worldbuilding here, will pay off later. And it is coming together if roughly. 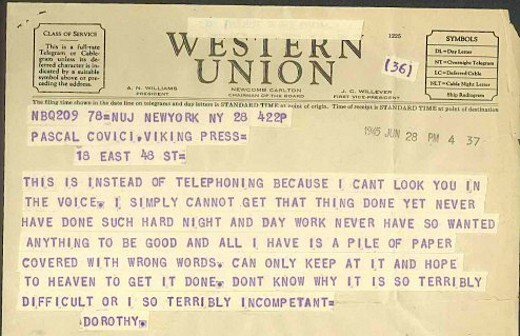 This entry was posted in Quotes, Uncategorized, writing life and tagged deadlines, Dorothy Parker, Quotes, Writer's Block, writing life on August 14, 2012 by Karen Hancock. What an absolutely beautiful phrase: “I can’t look you in the voice.” Just lovely. Glad you liked it. And thanks for the encouraging words! I appreciate them. Oh Karen, I am feeling with you today. Even my mostly right words seem wrong this morning. This is when I am tempted to ask myself if it’s worth it, and even though I know the answer is YES, it’s still hard. Praying for you today! And yes, it’s worth it.